← A wonderful week doing Absolutely Nothing…. I need a new pair of jeans. I never actually considered jeans as a wardrobe staple until about 10 years ago when I bought my first pair of PPQ jeans. They changed my life and I have never worn anything else since. Here’s a black pair – aren’t they just lovely. So now that PPQ are taking a, hopefully short lived, break from jeans, I’m thinking about trying something else. But I have absolutely no idea where on earth to even start! I tried a pair of Superfine grey skinnies on once, a few years ago when they were the jean to own. I remember it so very very clearly. The changing room in Liberty, the excitement of having finally plucked up the courage to join the grey skinny jean gang and then I put them on. I can’t tell you how dreadful they looked. They did nothing for me from any angle. I felt like someone had painted my legs, badly, in grey using a spatula and the shape made my rather short legs look like stunted, over-ripe, bananas. The disappointment was enormous. In fact so much so, I’ve never spoken about it until now. I found the whole thing deeply embarassing – luckily I was on my own and didn’t leave the changing room – but the flipside was on the very same day in the very same department I bought the most fabulous pale blue cotton APC sun dress which I love and adore. So take that, Superfine skinny grey jeans which I thought I wanted. Since then I’ve never strayed from my PPQs but after 2 children and thousands of outings, my 7 pairs are starting to look a little frayed around the edges and until I can buy a new pair, it’s time to strike out on my own. So what should I be looking for? I’ve trawled the pages of Net-A-Porter and it just gets more confusing every time. 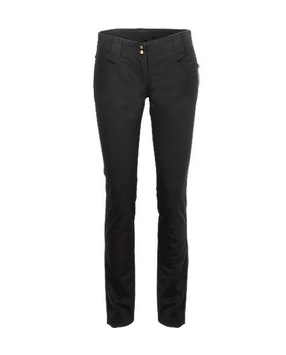 I don’t want bright coloured ones, I know that, I’m a jean purist so I’ll stick with dark blue, possibly black. I don’t want any stupid creases to make it look like I’ve been sitting down in them for weeks – why do they do that? – and I don’t want really low ones which show my, not quite so pert any more, bottom. I also don’t want ones which strangle my ankles, I’ve never been good in those. I need a very slight flare and a little bit of stretch but not of the Jeggings variety – another piece of leg wear which really upsets me. So any help gratefully accepted please. Oh and I’m also not spending anywhere near £200 on a pair of jeans. That’s just plain silly. Ps. My rant about Superfine skinny grey jeans only related to me and my silly legs. Everyone else I’ve ever seen wearing them looks amazing. Really. I just thought I’d better clear that up. I wear Seven straight leg – very light stretch, no skinny ankles, no horrid low rise on post-motherhood belly. They also shorten very well, which is important for me. I can wear nothing else. Unless they’re twill rather than denim. Then I wear J Brand. I tried on some lovely Current Elliot straight legs in New York last month. But they didn’t have any 25s left in the rinse I wanted. They were lovely though.